Paragon are a heavy metal band from Germany formed in 1990, continuing a legacy that began with Accept, Grave Digger and Helloween. As pioneers of German power metal, these bands forged a path that Paragon now follow. Ten albums over a twenty year career has brought the band to their eleventh studio effort, 'Hell Beyond Hell'. Well, what can you say about legends Paragon that hasn't already been said. Pioneering power metallers from Germany, consistent performers over the years, great live act and now a new album...sweet. Thunderous opener 'Rising Forces' is a high paced, rollicking good romp that sets the tone for what's to come. Head bangingly fast, get your fists in the air, this is gonna be a blast. 'Hypnotized' is raucous with some brutal riffs and an infectious chorus line that is catchy and will definitely have you singing along at the top of your lungs. Title song 'Hell Beyond Hell' is a feel good amble of blistering guitars and galloping rhythms that chugs relentlessly and flies the flag for everything great about German power metal. 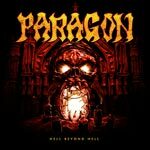 Paragon are at that stage in their career when they no longer have to prove their worth, yet they still manage to upstage some of the much newer and younger bands out there. Songs like 'Heart Of The Black' are epic masterpieces, showcasing the talent and skill of experienced and (dare I say it) veteran musicians. With a pounding rhythm and a foot tappingly addictive undertone, 'Heart Of The Black' is a meandering storm, swinging from side to side, injecting its authority on the listener and with a superb slower mid section instrumental 'Heart Of The Black' is the stand out song off the album. As a bonus, there is an edited version at the end of the album without this instrumental, but my advice would be: listen to the full length version. 'Stand Your Ground' rattles along at pace, providing ample (violent) head banging opportunity. As with all power metallers, the chorus lines are memorable, addictive and always sing a long. 'Stand Your Ground' is no exception. 'Meat Train' turns up the energy level and races on through some cracking riffs and sparkling rhythms. Some bands, for whatever reason, just cannot seem to get the backing vocals right, however, Paragon do. Not over complicated or too much, the backing vocals are spot on and add weight to the choruses on many of the songs. Another blisteringly awesome song is the up tempo, high intensity, energetic 'Buried In Blood'. The fastest song on offer, it also has some of the most brutal guitar riffs and hooks as well as a chant style chorus. 'Buried In Blood' is an awesome song. Suddenly the brakes are hit hard and the pace slows right down for 'Devils Waiting Room', a nine minute epic of mid tempo, foot stomping heavy metal. Never reaching top speed, but that doesn't matter, it is an epic journey of superb grooves and hooks and with support from the backing vocals. Paragon really do have this licked. The album is brought to a close with two bonus songs, the already mentioned edited version of 'Heart Of The Black' and the hard rocking 'Thunder In The Dark'. A thunderous romp with blistering guitars, galloping rhythms and a sing a long chorus. This is the stuff of legends and Paragon are legends. Overall, blisteringly powerful power metal from German legends Paragon, delivering the goods with passion and pride.